8912 Hewkii is a BIONICLE set released in 2007. He is one of the Toa Mahri. This is Hewkii's third appearance in a set (fourth including his appearance as a set that came with a Happy Meal at McDonalds). In the BIONICLE Universe, he was a Toa of Stone. He comes with the Mask of Gravity, an Aqua Warblade, and a Cordak Blaster. Chains hang down from his body. In the BIONICLE Universe, they were electrified chains. The warblade piece was also featured in the Toa Ignika and Vorox sets. 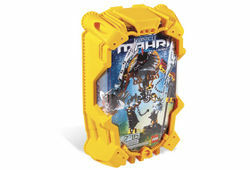 Like the other Toa Mahri BIONICLE sets, Hewkii features breathing apparatus, cordak ammunition and a large bunker piece made from the frame of the container. This is a description taken from LEGO.com. Please do not modify it. (see an archive of the product's page) Warrior of the waves! Armed with his aqua warblade, Cordak blaster, and Mask of Gravity, Toa Hewkii challenges the Barraki in the fight for the universe. His electrified chains give off a charge powerful enough to stun a Takea shark -- but will they stop a Barraki? Hewkii stands over 6" (15 cm) tall! Armed with Cordak blaster that really fires!